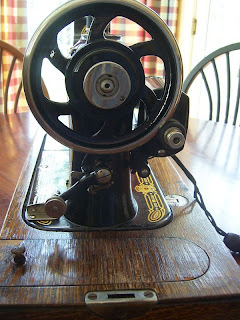 While we were living in Newton, Kansas, I bought this old sewing machine for $1.50 in an antique store. What we did was turn it into a lamp by putting a curved rod with a socket for the bulb at the back of the wooden base. Since I was in a phase of paper perforating in those days (and stencilling) I made a lampshade from scratch. 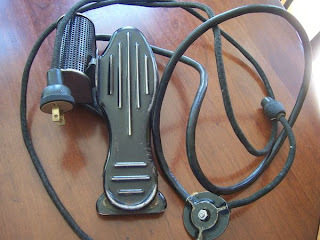 Those were really popular at the time and lots of fun to do. I took a class to learn how and did quite a few of them. Funny how things come and go. This is in the basement - no place to have it upstairs. Directly below this is a picture I found on the internet that shows how the machine looks in almost pristine condition. The story with it is it acquired by the relatives of a woman who had it for many years. 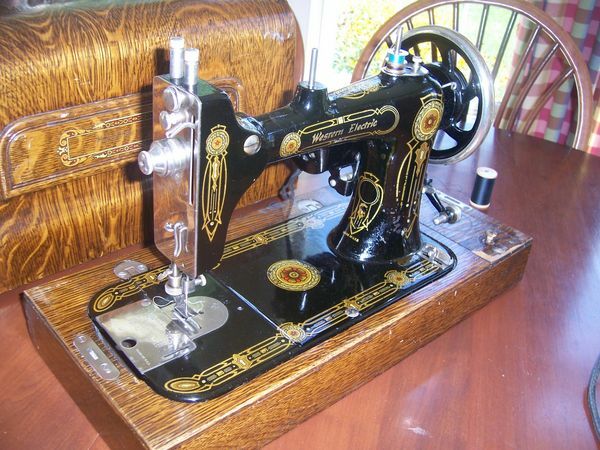 The machines were made in the late 1890's and discontinued in 1918 by Western Electric. This is a closeup of mine - not as shiny by any means but the pretty decorations are not too badly worn. Top picture from internet, lower one my machine. Look how pretty the one above from the internet is. 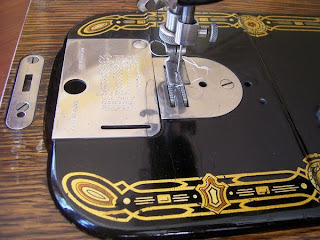 Here is what I keep on the bed of the machine - a couple of old scissors and a buttonhook. Below is the foot pedal and connection that I don't have. I just got an old feather weight as a gift from Delphines in Gaylord. So far I love that little machine. 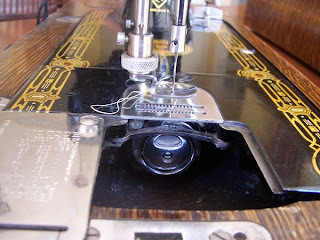 I just think unwinding and hauling my machine is too much work if I am asked to go somewhere that involves bringing my sewing machine. Mine smelled musty but am doing a treatment to it that the featherweight machine guy recommends. It is such a pretty little machine, it almost looks like a toy. I LOVE old sewing machines and wished I had nabbed my grandmother's when she passed away. Someday I'm going to have one to display. 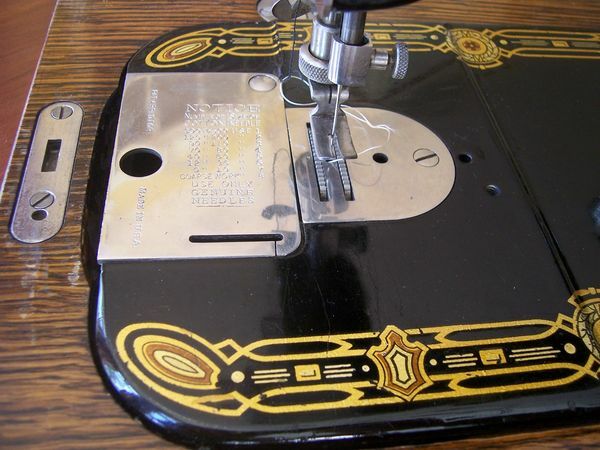 There is a guy (I'll have to look up his site) who restores machines and paints them like an auto body shop - you can even get one with polka dots -- oh the temptation. Maybe when I hit the lottery -- LOL! The design work on this machine is so pretty. Lots of it.